1. Select a Gearmotor Mounting Package. For End drive conveyors, select a side, bottom, top or gang drive mount (see below). If a Center Drive conveyor is being outfitted, refer to the Center Drive section. Be sure to note if it is for a 90° or Parallel Shaft Gearmotor. 2. 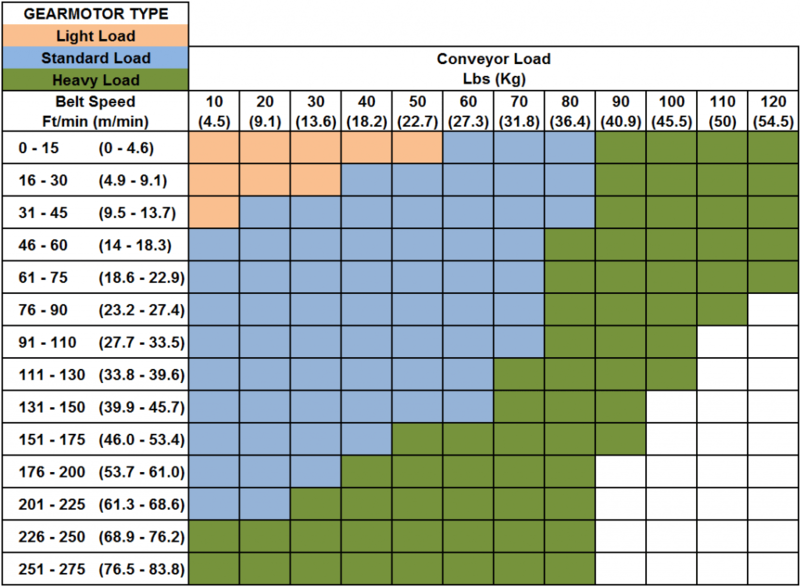 Using Belt Speed & Load Requirements, determine the required Gearmotor Type (Light, Heavy or Standard) for your application using the chart below. 3.Find the appropriate set of Belt Speed Charts (see below) for the Mounting Package you selected and choose between the Fixed or Variable Speed chart. 7.Note the RPM from Gearmotor, it will be needed to select the correct Gearmotor from the Gearmotor Chart. 8.Reference the Gearmotor Chart # to locate a compatible Gearmotor Chart. Be sure to select a Gearmotor Chart to match your Gearmotor Type (Light, Standard or Heavy) and your Mounting Package while meeting your electrical requirements. 9.Using the RPM from Gearmotor (Step 6), locate the Part Number for your Gearmotor from the Gearmotor Table.